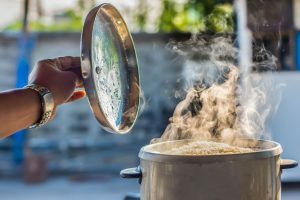 Cowan Catering / Articles / When can reheating rice cause food poisoning? Can rice cause food poisoning? Yes, you can get food poisoning from eating reheated rice, even if it is really hot. The source of any issues, however have usually happened before the reheating takes place & cooling & storaage can cause problems. Cooked rice must be cooled quickly (within 90 minutes, before being refrigerated) and must not be left standing at room temperature, when the spores can grow into bacteria. These bacteria will multiply at room temperatures and may produce toxins (poison produced by bacteria) that cause food poisoning. It is extremely important that the cooling process is kept as short as possible to reduce the likelihood of toxin formation. NHS guidelines are for example to cool cooked rice within an hour, before refrigerating. Bacillus Cereus is a food poisoning pathogen and consuming it may produce symptoms of vomiting or diarrhoea for around one to five hours afterwards, and the symptoms may last about 24 hours.